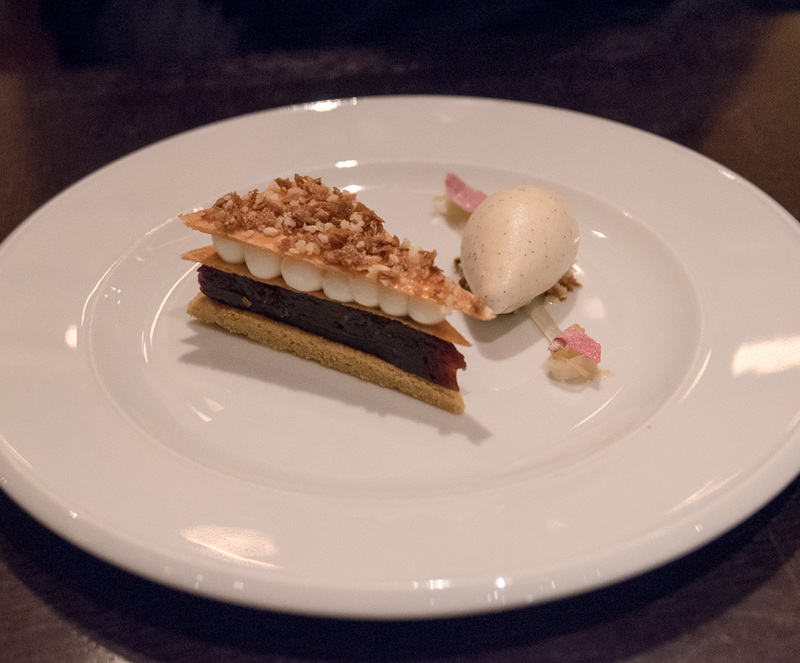 A few months ago, during my European travels in December and January, I was fortunate enough to visit Dinner by Heston Blumenthal in London. 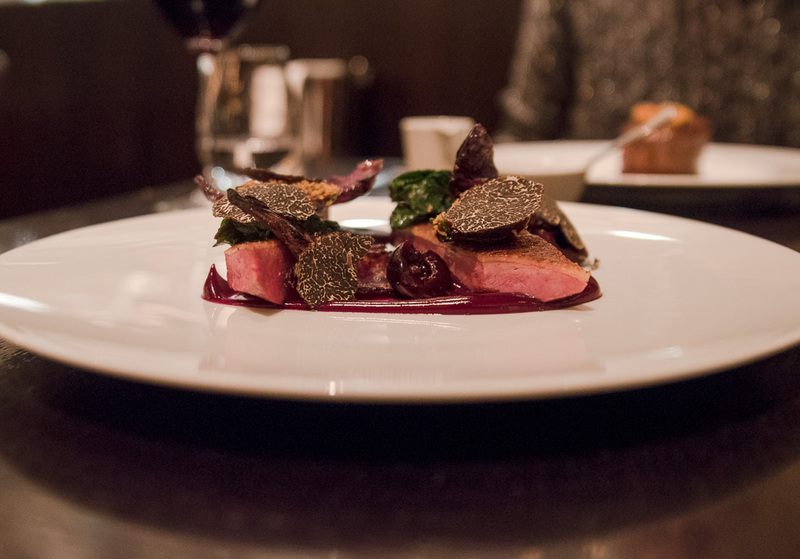 This two Michelin Star restaurant, situated in Knightsbridge, is any foodie’s dream to visit. My benedict and I arrived at The Mandarin Oriental. It’s large double doors, exquisite entrance hall and enchanting spiral staircase definitely set the tone for one of the top fine dining experiences. We were directed to the restaurant and greeted by the front host who offered to hang up our heavy winter coats. We were then seated at a table across from the open plan kitchen before being offered some wine by the sommelier. Having eyed out the restaurant’s Instagram page, my benedict had already decided on the “Meat Fruit” starter. This was a spiced red wine, chicken liver parfait served with grilled bread. The smooth red appearance of the chicken liver parfait gives rise to its name, giving it a fresh, juicy, fruit like look. It’s quite uncanny actually. The starter tasted great too. I opted for the “Sherried Scallop” starter. 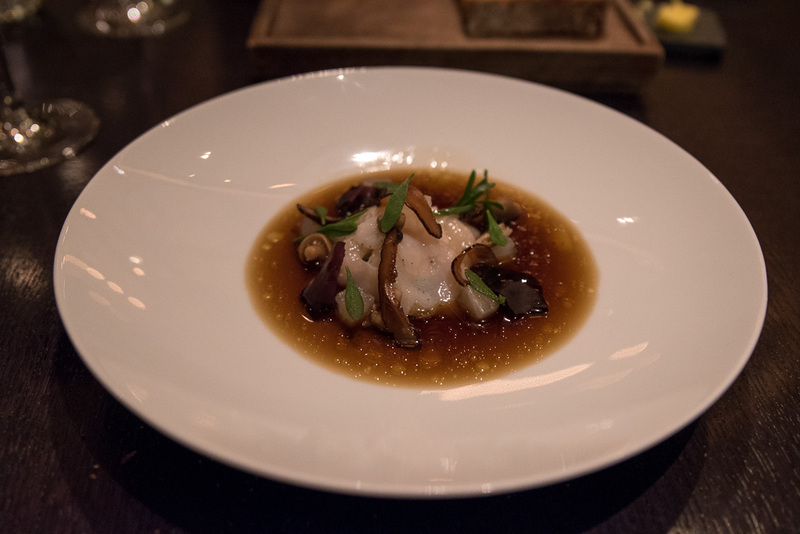 This was scallop tartare served with grilled shiitake in a sherry mushroom broth. It was delicious! The broth was rich in flavour and ever so tasty. Really enjoyed this starter. For my main meal I had the Fillet of Hereford Beef. This was served with a side of the most interesting and unusual mushroom ketchup and Heston’s famous triple cooked chips. My meal was absolute perfection! 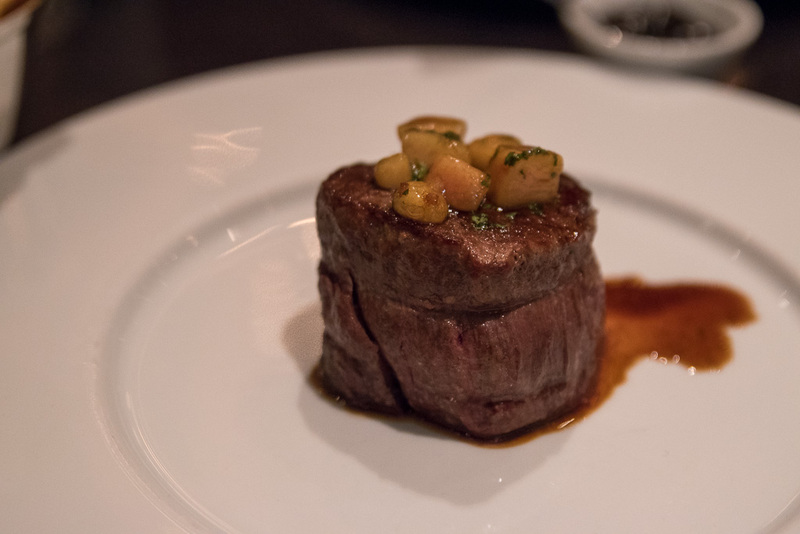 The fillet was tender, perfectly cooked (obviously), juicy and delicious. 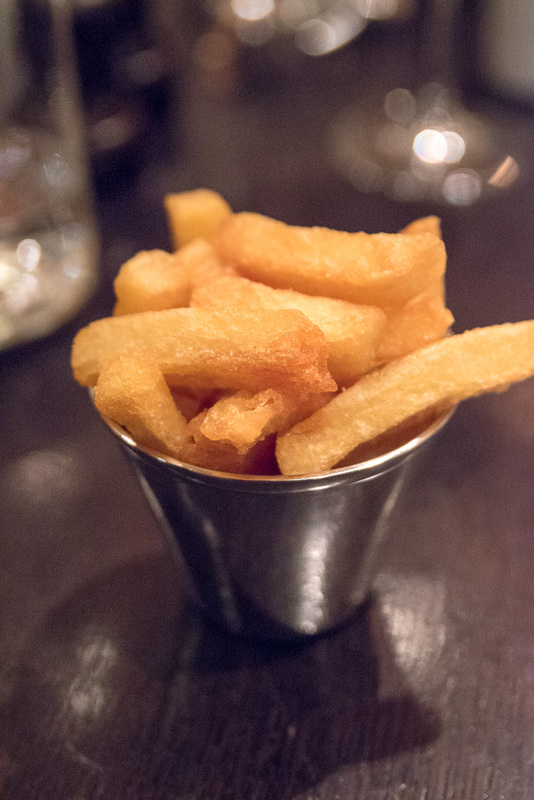 The potato chips were amazing; well-seasoned, cooked throughout and had that perfect exterior crunchiness. I loved the mushroom ketchup too. It was so unique, yet tasted great! My benedict chose the Powdered Duck for his main. This was braised duck breast served with grilled red cabbage and pickled cherries. Just another fantastic dish from Dinner by Heston Blumenthal. For dessert I selected the Gingerbread Ice Cream. This was mulled wine poached pear with salted caramel and smoked walnut mousse. It was a rather bitter dessert and while it was really good, it was perhaps not something quite suited to my sweet tooth. Dinner by Heston Blumenthal is certainly a bucket list type of dining experience and something I’d really been looking forward to for quite some time. The restaurant itself is beautiful and very elegantly laid out with simple and clean looking décor. The service was good and nothing could be faulted, however there was just something missing from our experience. 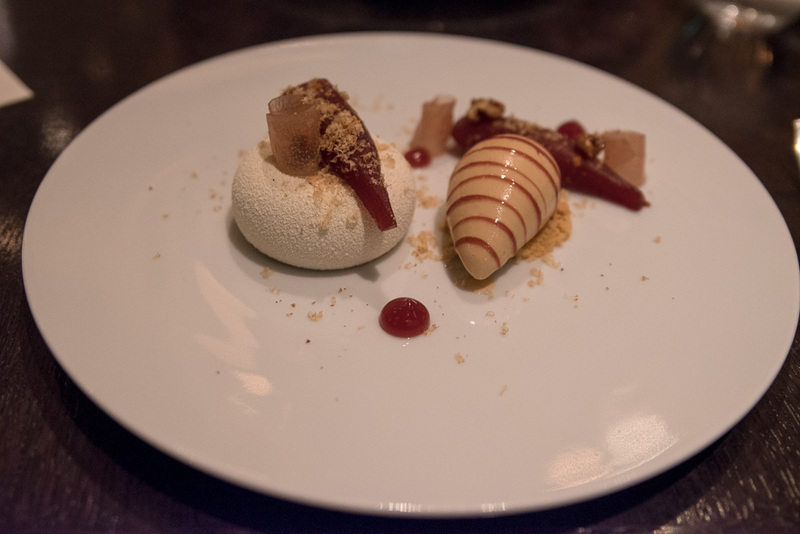 Perhaps, partly due to a really high expectation on our part and an intense build up and anticipation of the experience we expected at Dinner by Heston Blumenthal, but we left feeling that it wasn’t a particularly special or memorable experience. There were no surprise elements or complimentary courses – such as a pallet cleanser for example – and we almost had the sense that we were being rushed and were merely just a slotted booking of many for the evening. The food at Dinner by Heston Blumenthal was fantastic, no doubt about it, but given the costs and lack of that je ne sais quoi, I don’t think I’d rush back to experience the restaurant again on a future trip to London.